Paris Fashion Week came to an end on October 7th, concluding a month of intensive work by our fashion houses in presenting their Spring-Summer 2016 collections. Marked by shows rivalling one another for most creative and dramatic scenography, these nine days were the chance for a first glimpse of the innovative and sophisticated looks created by Loewe, Dior, Kenzo, Céline, and Louis Vuitton. Jonathan Anderson continues to redefine the Loewe woman by playing with textures and proportions. Linen, plastic wrap, mirror shards, metal – organic materials and experimentation boldly collided and colluded along an interpretative tightrope of graphic and contemporary styling. Leather – more discreet, but still central to the show – appeared on trench coats, oversized pants, and flowing dresses. Expressed in infinite ways through the leather goods, it is clearly still the House’s core material. Surrounded a mass of blue delphiniums in the Louvre’s Cour Carrée, the Dior show was a tribute to feminine sensibility and delicacy. Raf Simons’ vision: “the collection should exude a kind of purity.” Flowing, sheer fabrics revealed Victorian-inspired lingerie sets in white cotton, sometimes covered by nothing more than the House’s signature Bar jacket. 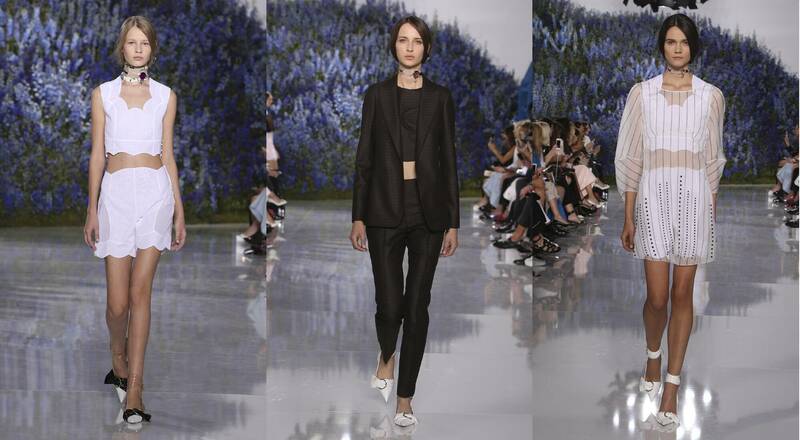 Black hovered in and around a palette of pristine whites in a feminine reinterpretation of the three-piece suit. 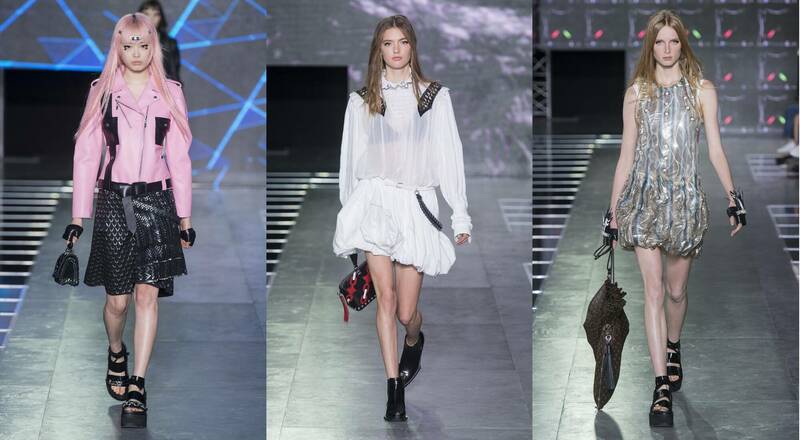 The Dior look is structured, yet steeped in the romantic lightness that buoyed the entire show. At Kenzo, the dynamic design duo of Carol Lim and Humberto Leon created a vivacious collection in which the woman is interpreted as a traveler, transposing her nomadic memories into her daily life: The swimsuit becomes an undergarment worn under geometric tops and skirts, structured by irregular gores. Diminutive bags trim the belts, while larger versions attach to the wrist with carabiners. The feet are shod in rubber-soled sandal-boots or diving shoes. The designers’ creative signature can again be seen in the impeccable mastery of prints and primary colors, forging a graphic landscape further textured by zigzag seams and reinterpreted hound’s-tooth checks. Céline’s Phoebe Philo presents subtle contrast in her Spring-Summer 2016 collection. The first looks mix and match silk nighties trimmed in delicate lace with black studded boots. The waist, so emphasized in the coats, later disappears beneath long, flowing dresses, revealing feet shod in heavy boots. The Céline woman embraces masculine codes in garments with bold, imposing shoulders, wide tartan trousers, and subdued colors. Urchin-cut hair tops scarlet lips. 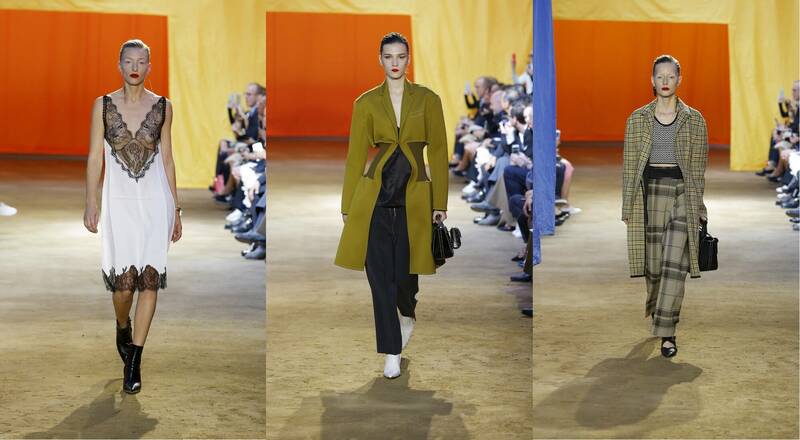 Phoebe Philo reaches for a nuanced statement, fashion that is sensual, contemporary, and practical. Nicolas Ghesquière at Louis Vuitton presented a futuristic collection in spectacular digital décor at the Fondation Louis Vuitton. The first look, resembling a manga heroine, sported leather, zippers, and straps, which were ultimately the leitmotif of the show. The stark, androgynous style of studded leather jackets and fishnet was softened by ruffled skirts and chiffon dresses with embroidered metallic flowers. Following a string of Monogram-sleeved perfectos, the catwalk display ended in iridescent architectural dresses straight out of a sophisticated science-fiction flick.